A popular hagiographical collection of a dozen youthful saints, published for the Jesuit College of Munich, in a pretty South German painted binding whose floral motifs echo the allegorical frontispiece and the theme of the collection. The boy-saints were chosen for their particular devotion to the Virgin, each Saint being described in the title as one of the 12 lilies of the Virgin's Garden, composing Mary's crown. In the engraved portraits most are depicted holding a lily. Included are Alexius, Aloysius Gonzaga, Bernadinus of Siena, Casimir, Edmund, Archbishop of Canterbury, Emeric of Hungary, Herman Joseph, Nicetas, Pelagius, Stanislaus Kostka, Thomas Aquinas (as a youth), and Ubaldus, the last written by father Jacob Bidermann. The frontispiece shows a half-view of Mary on the crescent, with a crown of flowers, floating above a bird's-eye view of a formal garden. The engravers of the 12 portraits of the saints include Lutz (3), Gottfrid Pfautz (4), Gottlieb Wolffgang after Johann Asam, Johann Melchior Kraus, and Elias Bock. Two of the plates are unsigned. 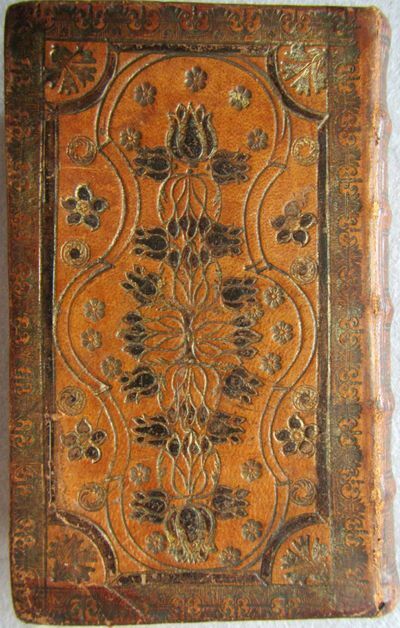 The "Munich 1768" that is stamped on the spine of the binding may refer to the place and date of binding, but it is an unusual position for such information. Earlier editions appeared in 1716 and 1745. OCLC locates two copies of this edition, of which one in the US (Cleveland Public Library), plus 3 US copies each of the 1716 edition and the 1756 edition. De Backer - Sommervogel I, 751,2 (1716 edition). Sommervogel Bibliotheca Mariana 1468.